Aquaman is Warner Bros.’ latest entry into the ever-expanding DCEU, but it’s also something much more fascinating on a technical level. It’s an action movie that takes place mainly underwater, something that could either be brilliant or absolutely terrible. While the first images from the film don’t give us an idea of which way the tide will turn, they are pretty to look at. Though it might have seemed odd that there hasn’t been all that much early promotion for Aquaman up until now, it’s worth bearing in mind just what kind of world director James Wan and the production team are creating. In a new series of photos, which debuted on Entertainment Weekly, you get a distinct sense of the murky, ethereal majesty that Aquaman’s Atlantis is going for. Even though they’re just stills without any heavy visual effects in place, you can see the potential the movie’s underwater scenes have to be visually stunning. 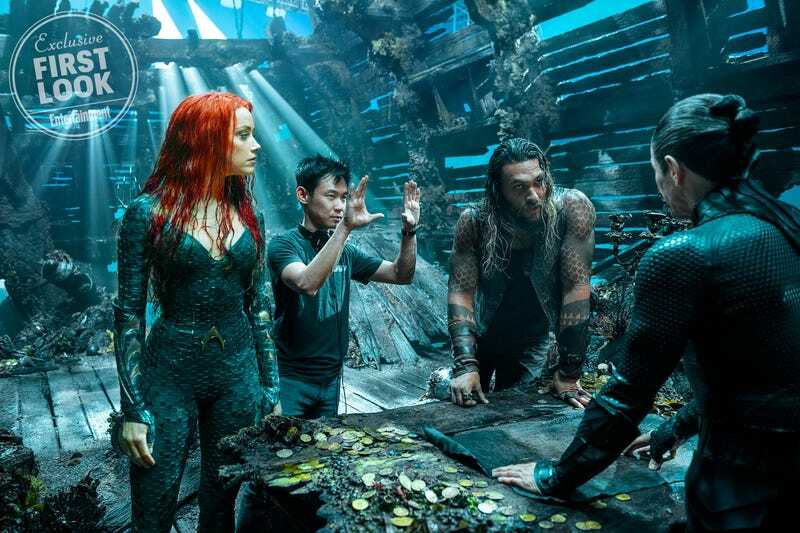 From left to right: Amber Heard as Mera, director James Wan, Jason Momoa as Aquaman, and Willem Dafoe as Vulko. 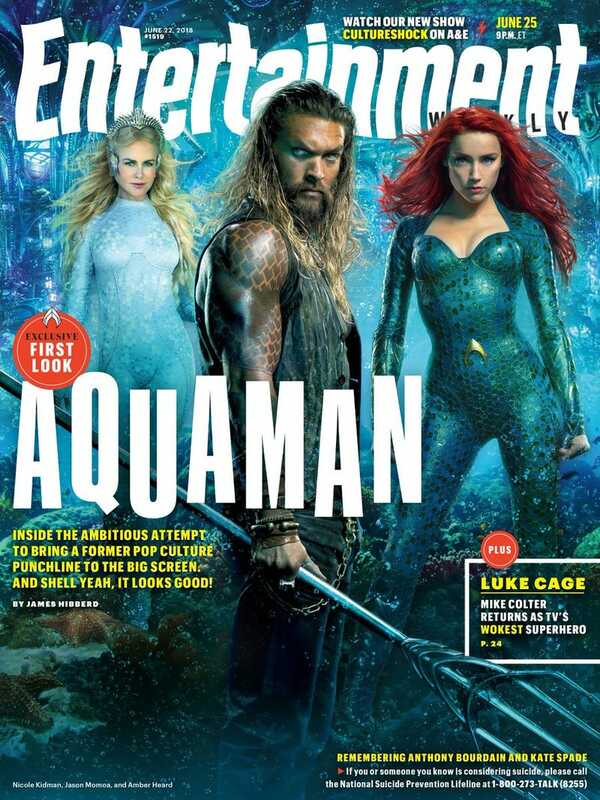 Along with a few choice photos of Aquaman refusing to wear sleeves, Entertainment Weekly also shared the first look at Aquaman’s Black Manta (played by The Get Down’s Yahya Abdul-Mateen II) and a prototype of his signature armour. Though Black Manta won’t be Aquaman’s primary foe in the film, Wan described the character as “part mercenary but full-time pirate who in his suit will look like some crazy alien from outer space.” This bodes well. Seriously. 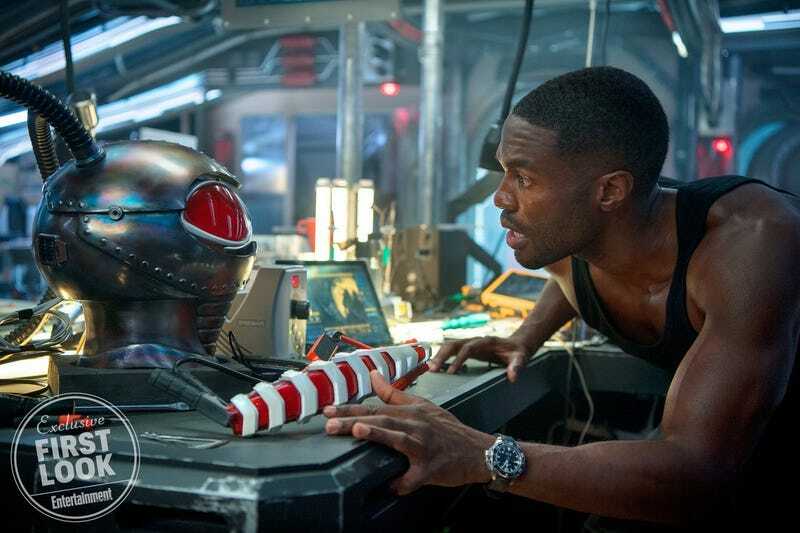 Black Manta (Yahya Abdul-Mateen II) marvelling at his helmet. Out of all the new details that surfaced today, the oddest bit is what Nicole Kidman looks like in her costume as Queen Atlanna. She looks absolutely fantastic, but it’s really, really going to be hard to buy her as Jason Momoa’s mother when Aquaman hits cinemas December 14.